Fiction – paperback; Scribe; 448 pages; 2016. Review copy courtesy of the publisher. It took three years for this fine Australian novel to be published in the UK — and the wait was definitely worth it. 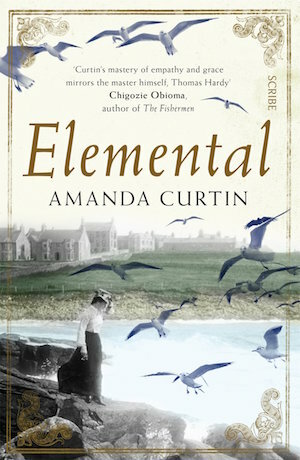 Amanda Curtin’s Elemental is a masterpiece in storytelling, incredibly evocative of time and place, and with a lively and entertaining character at its heart. That character is Meggie Tulloch, a woman born in the late 19th century to a traditional fishing family on the north-east coast of Scotland, who tells her life story to her granddaughter — affectionately addressed as “lambsie” throughout — in a series of three notebooks entitled Water 1891-1905, Air 1905-1909 and Earth 1910-1932. In a voice that is confident, beguiling and intimate, Meggie reveals the hardship of living in a small (and superstitious) village at time when women were subservient to men, often cruelly treated by them, and where educational options were limited and career opportunities non-existent. Into this harsh world, Meggie finds herself ruled by a tyrannical grandfather and shunned by the village and its fisherfolk at large for having red hair, because it was believed to bring bad luck on the sea. But she keeps her own counsel, forges a close bond with a pet dog she’s allowed to keep, and looks to her older sister, Kitty, for friendship. It was not as I had imagined it — the sea, when it was all around me. From the boatie shore, it had seemed for all its restlessness, something fixed — a space to cross, with the wide world beyond it. I could never have guessed that the sky grows even further away instead of closer and nothing is fixed at all. It was then I began to wake. Here I was, between one life and another. Between a girl of fourteen and in school, working at whatever the family said she must, and a girl of fourteen and about to earn money in her own right. Between a place of grim restraint and a place, I hoped, of freedom. I had been warned about the ruthless sea the whole of my life, but even at fourteen it seemed to me that nothing the sea could throw up could be as ruthless as what I left behind. Before long, Meggie gets married then emigrates to the other side of the world — Fremantle, on the coast of Western Australia — to set up a new life, far removed from the one she left behind. But then the First World War comes along throwing up yet more, perhaps tougher, challenges. In telling the story of one woman’s life from cradle to grave, Curtin is able to chart historical changes as well as the ways in which a person’s own relationships — with family, with friends, with colleagues and loved ones — alter over time. It’s heartbreaking to see the relationship between Meggie and her sister fall apart, not simply through distance but also by the inability to properly communicate with one another. It’s the same with Meggie’s marriage, which is blissfully happy to begin with before it crumbles away to nothing, mainly through the advent of the war and the horrible way in which it damages her husband’s confidence. The real strength of the novel, however, is in its depiction of the traditional fishing village of Meggie’s childhood and the brutal reality of life at sea. The descriptions are so evocative — of the weather, of the rituals and traditions of fishing folk, of the rich language, and of Meggie’s longing to escape — that it really does feel as if you are there struggling to walk through the howling winds and bitterly cold air. I’d go so far as to say the first 215 pages of this book are some of the finest historical fiction I’ve ever read; it’s so redolent of a Scottish fishing village more than 100 years ago. Later in the novel, there’s a dramatic switch in tone and narrator, as Meggie’s granddaughter and daughter-in-law take up the story in 2011, a switch I found particularly jarring. I felt the loss of Meggie’s voice keenly, but once I’d got over the shock and reoriented myself, I could appreciate Curtin’s desire to show the long-lasting legacy of Meggie’s life on her family. She may have led a small, seemingly uneventful life, but it was well lived, and filled with pain, courage — and love. For other takes on this novel, please see Eric’s review at Lonesome Reader and Lisa’s at ANZLitLovers. This is my 14th book for #ReadingAustralia2016 and my 10th for #AWW2016. Thanks for the mention, I loved this book, loved it to bits. Amanda Curtin has another novel due out soon and I can’t wait! I had to go and buy this one straight away – I can’t resist anything if the words ‘finest historical fiction’ come attached. Can’t wait now! I hope you like it! I was really impressed with the Scottish half of the novel; felt so authentic. It’s such a great read, Lizzi; honestly, I ate it up in a week and it’s a really thick book (448 pages!). Pingback: ‘Elemental’ by Amanda Curtin | Perth Words... exploring possibilities.